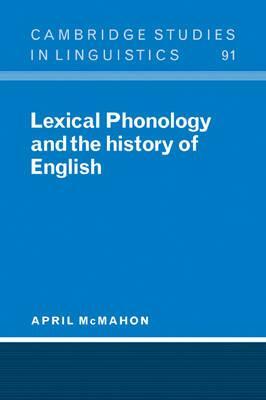 This book has two main goals: the re-establishment of a rule-based phonology as a viable alternative to current non-derivational models and the rehabilitation of historical evidence as a focus of phonological theory. Although Lexical Phonology includes several constraints such as the Derived Environment Condition and Structure Preservation, intended to reduce abstractness, previous versions have not typically exploited these fully. The model of Lexical Phonology presented here imposes the Derived Environment Condition strictly; introduces a new constraint on the shape of underlying representations; excludes underspecification; and suggests an integration of Lexical Phonology with Articulatory Phonology. Acknowledgements; 1. The role of history; 2. Constraining the model: current controversies in lexical phonology; 3. Applying the constraints: the Modern English Vowel Shift Rule; 4. Synchrony, diachrony and lexical phonology: the Scottish Vowel Length Rule; 5. Dialect differentiation in lexical phonology: the unwelcome effects of underspecification; 6. English /r/; Bibliography; Index.